More than 80 years after George Orwell wrote in his classic Animal Farm that "all animals are equal, but some are more equal than others," his barbed observation on disparity rings ever truer for humankind. According to a 2017 report by Credit Suisse Research Institute, 10 percent of the world's richest population owns 88 percent of all global wealth, while "3.5 billion individuals—70% of all adults in the world—have wealth below USD 10,000." That includes some who could be living in grinding poverty. Poverty devastates the whole family, often causing children to drop out of school early to start working. 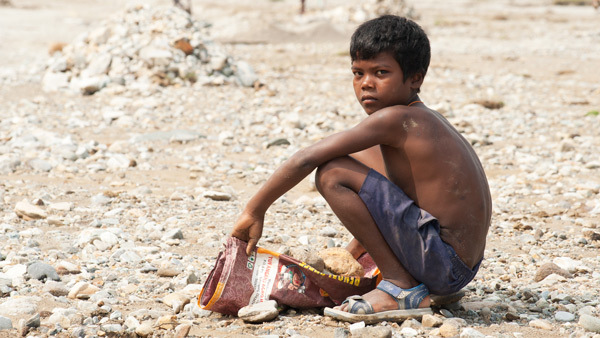 This boy is one of 168 million child labourers doing the backbreaking work of collecting, breaking and selling rocks from a nearby river. Despite improvements in some parts of the globe, the World Bank says "extreme poverty remains unacceptably high. "1 Globally, 1 in 10 is below the poverty line, somehow surviving on less than $1.90 (USD) a day. Not surprisingly, then, fair employment and rights at work are among the core emphases of the United Nations' annual World Day of Social Justice, celebrated on Feb. 20. Yet, "the effects of an increasingly sophisticated and prosperous India have not reached its poorest and least educated citizens," concludes Devin Finn in an article for the University of Denver's Human Rights and Contemporary Slavery digest on bonded labour. Across South Asia, "Hundreds of millions more live slightly above the poverty line, more than 200 million live in slums, and about 500 million go without electricity," notes the World Bank. Though the number of people in the region living in "extreme poverty" has been slashed in the past decade, around 62 million children still must work to help support their families. 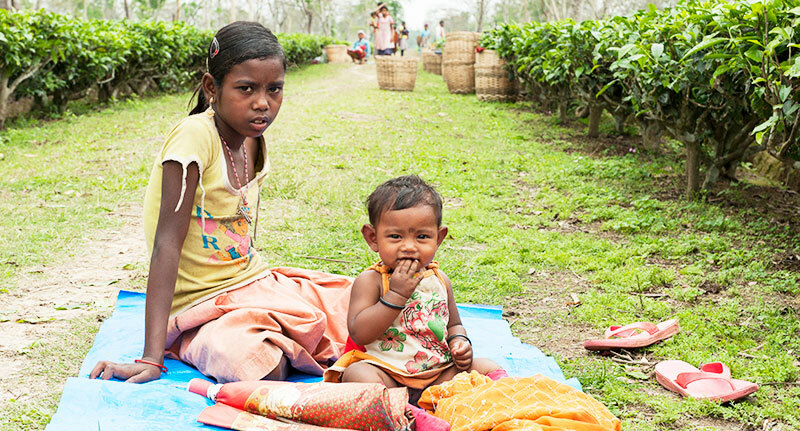 Tea plantation workers often only earn an average of $1.30 (USD) a day. Similar exploitation occurs in the tea and handmade carpet industries. 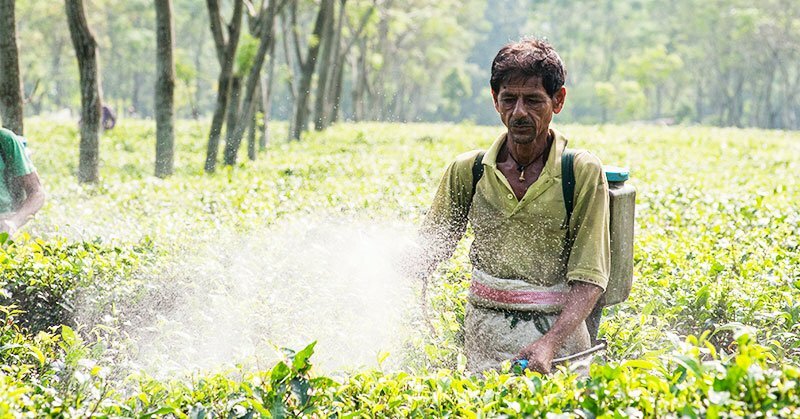 One investigation of a large plantation found "a shocking disregard for health and safety,"7 with workers spraying chemicals without protection, children working, and families forced to defecate among the tea bushes because there were no toilets. The International Labour Organization completed a recent study8 of conditions in the Uzbekistan cotton harvest, historically labeled as one of the worst human rights violations of forced labour. While it was stated by The Cotton Campaign9 in 2015 and 2016 that "the government of Uzbekistan forced more than a million people, including students, teachers, doctors, nurses, and employees of government agencies and private businesses to the cotton fields, against their will and under threat of penalty, especially losing their jobs," the ILO study noted distinct improvements in 2017. It concluded that "the systematic use of child labour in Uzbekistan's cotton harvest has come to an end" and that efforts were being made to ensure all labour was voluntary. Still, the ILO found that "a certain number pick cotton during at least some part of the harvest as a result of persuasion, pressure or coercion." Uzbekistan president Savkat Mirziyoyev stated at the United Nations General Assembly, "In cooperation with the International Labour Organization, we have taken effective measures to eradicate the child and forced labour." Many millions more may not be so clearly enslaved, but they are also caught in poverty's endless cycle, scrabbling to make a living as day labourers or scavengers. Often, parents are forced to make their children work too, to try to make ends meet. But keeping them out of school just ensures another generation remains on the bottom rung of the ladder. 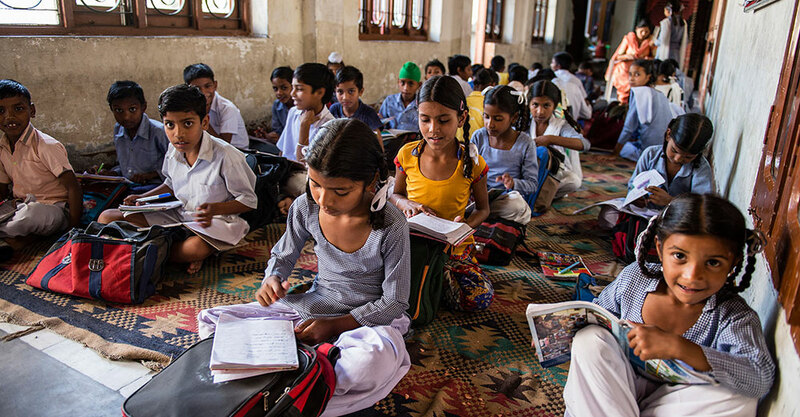 The number of out-of-school children in South Asia constitutes "a formidable challenge," says the ILO. It estimates more than 25 million boys and girls aged 7 to 14 do not attend school in Pakistan, Bangladesh and India alone. "Far from economic inequality being seen as purely a 'labour rights' issue, the world is realizing that economic and social inequalities are intrinsically linked to human rights," says U.K.-based ASI. "Inequality is one of the biggest human rights issues of our time." Very practically, poor working conditions and poor pay mean poor health. According to the World Health Organization (WHO), "Nearly 9 million children under the age of five die every year, according to 2007 figures." Of those children, one-in-three deaths are linked to malnutrition.11 In some impoverished communities in Asia, more than half of the children have a body mass index below 18.5, writes Satya Sagar for the Canada-based Centre for Research in Globalization (CRG)12, "which is regarded as chronic sub-nutrition-placing them by World Health Organization standards in a permanent state of famine." For those who are considered "Untouchables"—that's some 300 million Dalits who fall at the bottom of the societal ladder—discrimination typically leaves them with only menial work no one else wants to do. The Indian government took affirmative action to enforce policies about caste discrimination "reserving a certain percentage of government jobs and admission to educational institutions, as also financial support through loans and special schemes, for these castes," reports the CRG. But such successes are often the exception rather than the rule. Seven decades after the government first introduced measures to address the caste issue, CRG's Sagar notes that "there is not a single positive indicator of social development" where lower castes feature prominently. "Whether it is land holdings, income, literacy, nutrition or health status, it is these sections-who constitute one-third of India's population-that are right at the bottom of the pile," he says. Migrant workers endure discrimination and social injustices too. In the 2018 Human Rights Watch Report on Sri Lanka, WHO reports that "The government took some steps to protect the rights of more than 1 million migrant workers in the Middle East and other parts of Asia, but many continued to face long working hours with little rest, delayed or unpaid wages, confinement in the workplace, and verbal, physical, and sexual abuse." "There's so much improvement and progress in this world," she said. "But for us, nothing has changed. We're still in the same hell." 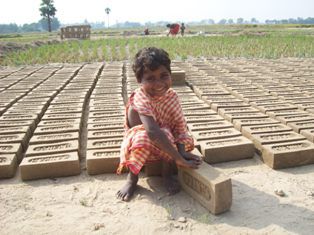 Most people in this woman's village are labourers at a brick factory. 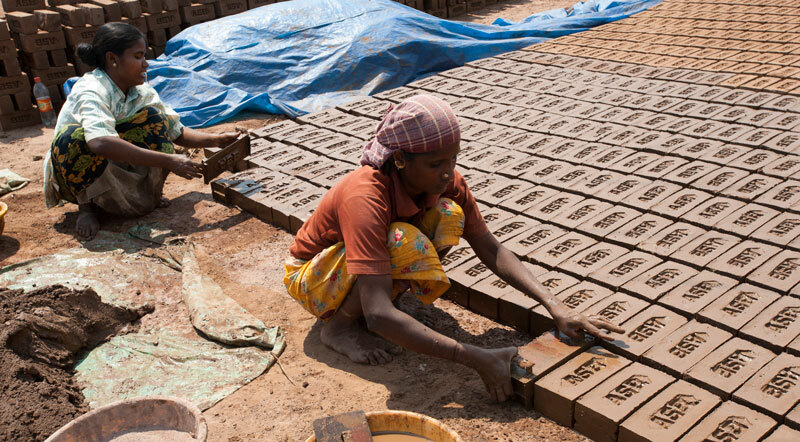 Women are often "invisible" workers in brick kilns, vulnerable to exploitation and having little to no rights. Women working in brick kilns as part of a bonded labour family are what ASI calls "invisible"—not even formally registered on the employment roll, with wages paid only to their husbands. Often forced to work in what are called "vulnerable" occupations, informal employment where they have no rights, women are more susceptible to financial exploitation. Pushed to the fringes, women may be forced to do jobs others refuse, like Suneeta. She told Germany's Deutsche Welle how she had been a manual scavenger—cleaning latrines by hand for 20 years to feed her family. Frequently involved in "cultural employment"—handcrafts and similar arts-based fields—women are more likely to have to supplement their income with more than one job, says the United Nations Educational, Scientific and Cultural Organization (UNESCO) report Precarious situation for women working in the field of culture. There are health consequences, too. In a University of California, Berkeley paper, The Rural-Urban Divide in India, Tathagato Chakraborty writes that lack of educational opportunities for girls "increases the fertility rate, maternal and infant mortality, and malnutrition in the family." With little education, basic hygiene practices may remain unknown. Furthermore, because the rights of women to land and property are rarely recognized, "this increases the risk of poverty to women and their families and increases poverty overall as women and children make up two-thirds of the population." Girls are "particularly vulnerable to the negative impacts of child labour," says the ILO, comprising the bulk of children in "some of the most dangerous forms of child labour, including forced and bonded labour, commercial sexual exploitation and domestic work outside of their home." Realizing that millions of women in India have become exposed to sexual assaults each year simply because of the lack of toilets, the government of India has taken up the task of building toilets and latrines in the rural parts of the nation. 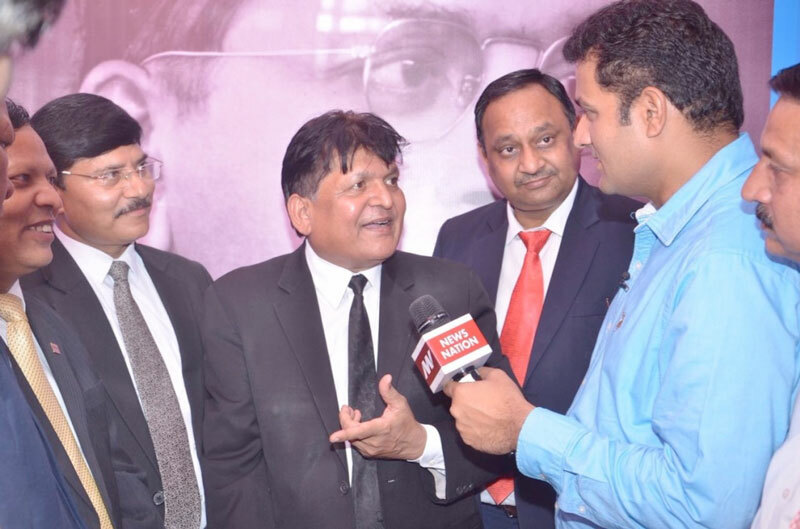 The construction of toilets under Prime Minister Narendra Modi’s dream project, Swachh Bharat Abhiyan (Clean India Mission), has gained momentum, with many NGO’s (like Sulabh International) joining the initiative. GFA World helped to build and install more than 10,000 toilets in 2016. That sort of action is taking place on large and small scales. At one end of the spectrum, the World Bank is supporting a $63 million (USD) empowerment project in Jharkhand, India, which aims to help adolescent girls and young women complete secondary-level education and acquire job skills. Another way of improving the situation for poor families has been providing microloans that keep them away from predatory loan sharks. Many families have found themselves caught in bonded labour for generations after borrowing a small sum, only for their debt to keep spiraling beyond their reach. The "Jeevika" program launched a decade ago in Bihar, India by the state and national Indian government has seen some 600,000 women helped to start small businesses as farmers, dairy and poultry producers and entrepreneurs in small businesses. 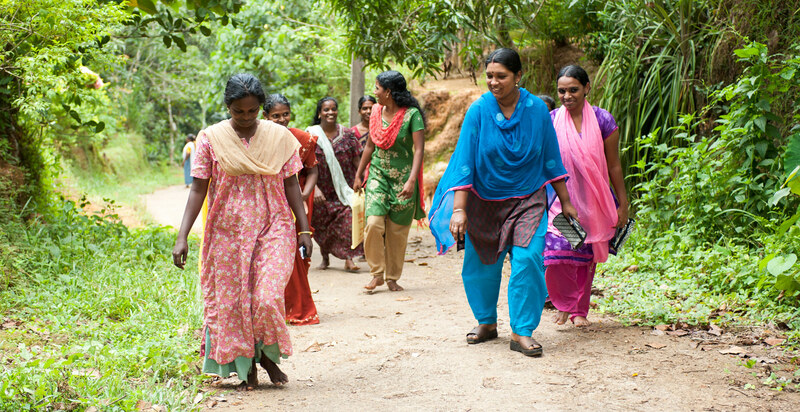 "These women are also emerging as a political and social force," notes India Spend. Increasingly aware of living in a globalized economy, where production is outsourced to where labour may be cheapest, some in the West are recognizing how their spending may affect the poor in other parts of the world. Yet while encouraging Western consumers to challenge companies about their supply chain practices, to ensure they are not supporting sweatshop businesses, groups like ASI don't advocate boycotts. Such actions "can actually make the situation worse and undermine the economy of an already poor country," says the organization. "As well as hurting employers using slavery-like practices, they could also hurt those who are not exploiting their workers, and worsen the poverty that is one of the root causes of slavery." 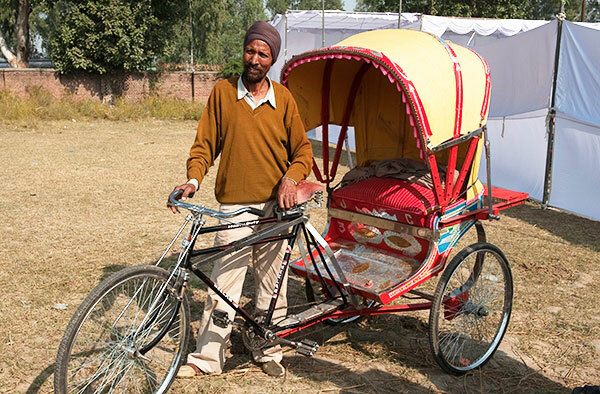 The gift of a bicycle rickshaw can change the financial situation of an entire family. The importance of greater access to education, especially for women and girls, cannot be emphasized enough. Funding such efforts "isn't charity but investment, and the returns are transformational," notes activist and singer Bono in a recent opinion piece for TIME magazine in which he asserts that "poverty is sexist." GFA's Bridge of Hope program helps about long-term change in families and gives the next generation a chance for a better future—one where they can rise above the cycle of poverty. When girls get an extra year's schooling, their wages increase by almost 12 percent, he writes. Closing the gender gap in education could generate up to $152 billion (USD) a year for developing countries. "When you invest in girls and women," he goes on, "they rise and they lift their families, their communities, their economies and countries along with them." One example of that is recounted in Global Fund for Women's (GFW) Breaking Through report on gender equality in Asia and the Pacific. After joining a women's self-help group, a 29-year-old became the first housewife elected to the panchayat, or local government, also helping win equal pay for equal work for women at a local factory. New opportunities have opened up for the more than 100,000 women who have completed one of GFA's literacy courses. Another 30,000 women are currently taking part in the program, which is offered in 16 languages. One graduate of the GFA-supported literacy program told how learning to read at the age of 40 had changed her life. "I have been deceived many times because of my illiteracy," says Baasima.18 "When I used to go for shopping, bad shopkeepers deceived me, taking more money and not returning the balance amount. But now I can calculate myself. They cannot deceive me. I am very happy now." Learning to read has not only enabled Baasima and others to provide and care for their families better-the health of your child is endangered when you can't read a prescription they may need-but it has also raised their standing in their communities. And along with that improved status can come a new sense of personal worth and identity as they discover God's love for them in the pages of the Bible. Indeed, all of GFA's efforts to address the inequalities that press down on millions across Asia are anchored in the belief that true social justice means not only seeking better opportunities for all economically and educationally, but also spiritually-the chance to hear of a God who loves all equally, and to see that love demonstrated through actions that help lift them up. While GFA celebrates the attention that the annual World Day of Social Justice brings to the plight of the overlooked and down-trodden and the enormity of the challenge, it quietly works year-round to change things one person at a time, echoing the approach of Mother Teresa, who remarked of her years caring for some of India's poor that, "There are no great acts, only small acts done with great love." A donation to GFA's Vocational Training fund can help a mother or father in Asia learn a valuable skill, generating income to escape the cycle of poverty. Then the precious little girl was enrolled in a GFA-supported Bridge of Hope centre, receiving a free education, a daily meal and medical care. Her parents said, "If the Bridge of Hope centre would not have been there, Bina might have still worked in that same brick factory as a child labourer and not as a good Bridge of Hope student."